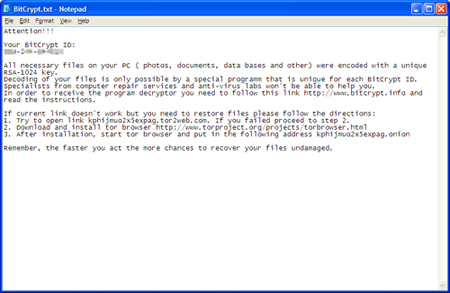 It appends the string bitcrypt to the encrypted file's extension. If you still cannot terminate the malware/grayware process because it is not displayed in Process Explorer, please restart your computer in Safe Mode. You may refer to this page for details. Right-click on the said process then choose Properties. If yes, right-click on the malware/grayware process again and choose Kill Process Tree. 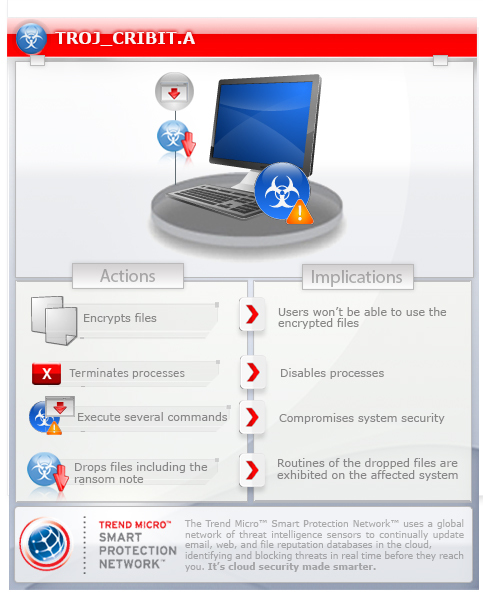 Scan your computer with your Trend Micro product to delete files detected as TROJ_CRIBIT.A. If the detected files have already been cleaned, deleted, or quarantined by your Trend Micro product, no further step is required. You may opt to simply delete the quarantined files. Please check this Knowledge Base page for more information.